On February 3rd at 4 pm, President Kim Benston marked the grand opening of the newly renovated Dining Center (DC) basement by cutting the red ribbon. The renovation, which started in fall 2016, aimed to make the basement more appealing and usable for students. 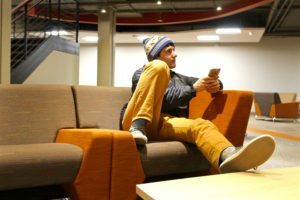 The space now has a movie theater and new Blackbox theater, meeting rooms for clubs, an office for Student Activities, and modern furniture for students to lounge and do schoolwork. Prior to the renovation, the DC basement had a few rooms that were used by various student groups, as well as music practice rooms for bands. However, much of the space went largely unused and was crowded with stacks of old miscellaneous furniture. Up until the official grand opening of the basement, the Dining Center underwent several other renovations, including updates to the entryway and outdoor lounge space. Now, all the changes to the Dining Center represent a more accessible and contemporary place for students to use. At the ribbon cutting ceremony, President Benston delivered a brief speech and recalled his own days at Haverford, back when the DC basement was a common social gathering space for students. The building that is now just the Dining Center also used to be home to student mailboxes and The Coop, which was just a small food kiosk at the time. Over the years, the basement gradually became outdated and less commonly used by the student body. But the key members of this project hope to change that with this renovation. President Benston also took a moment to thank the many people who helped to make this project possible, including Senior Vice President Mitchell Wein, Director of Student Activities Mike Elias, and Senior Associate Dean Steve Watter, who was a primary advocate for the renovations and the positive impact it could have for students. Benston also thanked facilities and housekeeping for being an integral part of the process. After the official cutting of the ribbon, attending students and faculty funneled down the stairs to check out the new space. Reactions were overwhelmingly positive as everyone explored all the amenities, including wandering into the meeting rooms, testing out the pristine furniture, and buying coffee and snacks from the variety of new vending machines. Several students were already discussing looking forward to using the space for group-studying or meeting with their clubs. Ultimately, the overhaul of the DC basement seems to be a promising additional area that students can freely access to study, gather, and host shows and events. 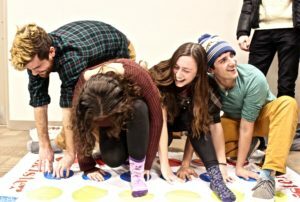 Later that night, students had already begun crowding in, playing games on loan from Nerd House and listening to a capella performances. If this is any indication, the DC basement is going to be a new, valuable space for students to hang out, study, and perform.